Go Out and Make A New Year Great! What a beautiful photo! I hope your 2018 is amazing. Good morning Debra. Alaska is an amazing place with such beauty. May your year be the best ever! Enjoy your day! Good morning Debra and Happy New Year to you. What a stunning photo and great run down of services too. Good Morning Barbara Todaro Wishing you the very Best also! Thank you Kat Palmiotti I hope your year is wonderful! Thank you Wayne Martin it makes it easy to take a picture up Here! Happy New Year! Hello Sheila Anderson Thank you very much! Happy New Year!! Though, it seems not much snow by the lake! hello Steffy Hristova Thank you! 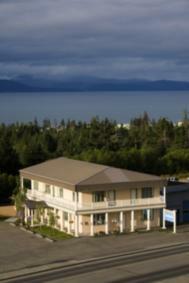 We dont have much snow this year anyway... but that is not a lake it is Cook Inlet...ocean view! Happy New Year to you too! Oh my gosh, that is one of the most gorgeous photos I've ever seen, Debra! Happy New Year to you too and I do hope that 2018 is your best year EVER! Why thank you very much Debe Maxwell, CRS Lovely New Years Greeting too!!! Happy New Year to you too! Hello Debb Janes EcoBroker and Bernie Stea JD You need to come back... this is actually Cook Inlet in Anchor Point The Volcano is Mt Illimana Thank you so much! Hi Debra Leisek - What a gorgeous photograph! Although many people dream Caribbean, I long for the Alaska sky and experience places like those where you live, such as Southern Kenai Penisula. I wish you many gorgeous sunsets and happy days in Homer and may your business thrive because of your heart and passion. Thank you so very much Patricia Feager I know you love the beauty of the sky and appreciate the beauty of the world. My hope is you are happy and healthy and enjoy the success you gain every day with your positive outlook on this crazy world we live in!